As 1917 began there was much discussion among sports enthusiasts in the Hill City about a new professional baseball team. Mayor Royston Jester Jr. was leading a group of local citizens exploring the possibility of once again fielding a team in the six-team Class C Virginia League. The Hopewell Powder Puffs franchise had folded after the 1916 season, and Lynchburg was the only city applying to provide a replacement. The other teams were the Newport News Shipbuilders, Norfolk Tars, Petersburg Goobers, Portsmouth Truckers, and North Carolina’s Rocky Mount Tar Heels. Lynchburg had fielded teams in 1886, 1894–1896, and 1906–1912. The fairgrounds, the city’s baseball diamond, had also hosted exhibition games between Major League teams passing through the city on their way north from their spring training bases farther south. Toward the end of the month, an update appeared: The league had decided on a $1,200 total salary limit for the twelve players on each team, not including the team manager. In addition, each team would contribute $750 to the league to cover its costs. On February 2, The News reported the group would apply for a state charter with the following leading citizens as board members: Lawrence W. McWane, president; H. H. Harris, vice president; and William T. McLeod, secretary/treasurer. Mayor Jester, Thomas D. Mays, and Kiah T. Ford would serve as directors. 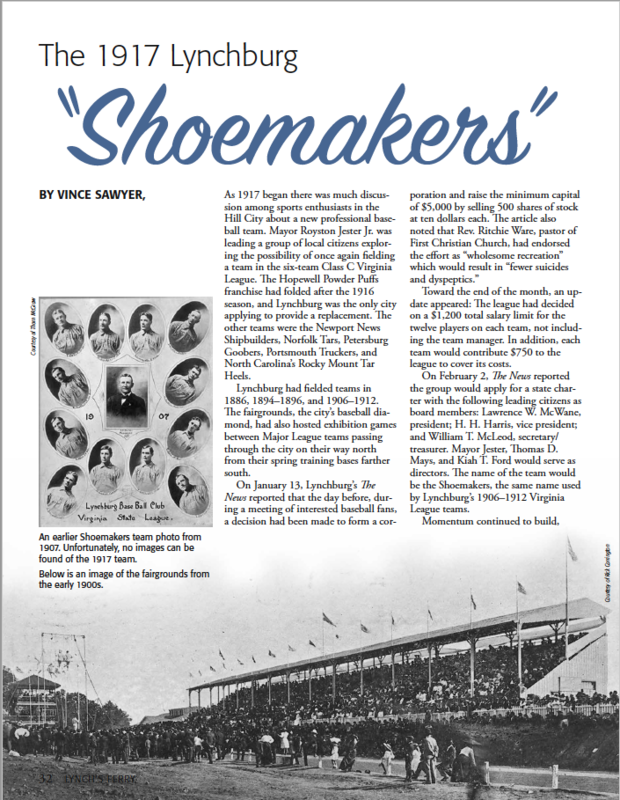 The name of the team would be the Shoemakers, the same name used by Lynchburg’s 1906–1912 Virginia League teams. Momentum continued to build, and by mid-February Mayor Jester had signed thirty-five-year-old Joe Stanley of Washington, D.C., to manage the team. All of five-feet-nine-inches tall and weighing in at 150 pounds, Stanley had a long professional baseball history, beginning with his 1897 debut with the Washington Senators at age sixteen. His seven-year Major League career spanned 216 games with the Senators, Boston Beaneaters, and Chicago Cubs. Stanley also had played and managed in the minors and served as player-manager for the 1913–1914 Springfield, Illinois, Reapers of the Central League. In 1915–1916 he played for the Central League’s Erie, Pennsylvania, Sailors. About thirty to forty players were expected to try out for the Shoemakers, hoping to be one of the twelve players on the team. 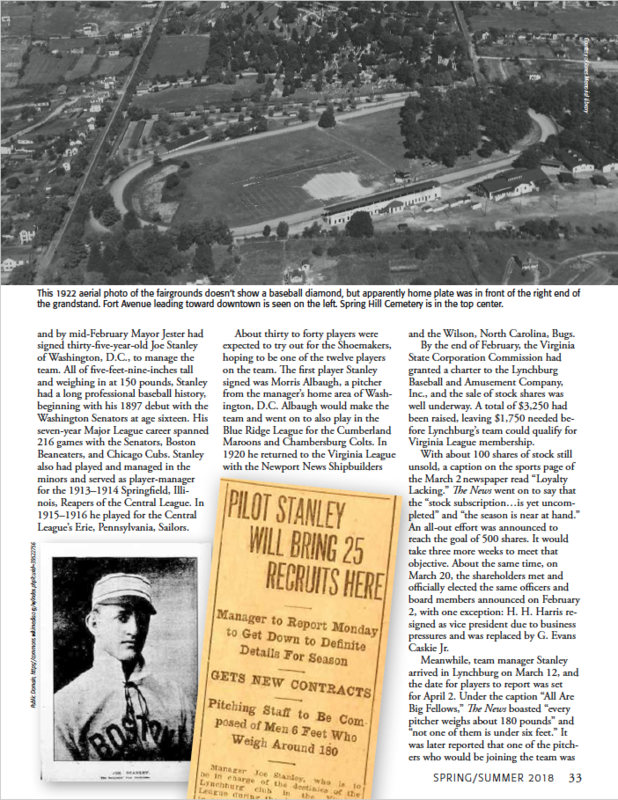 The first player Stanley signed was Morris Albaugh, a pitcher from the manager’s home area of Washington, D.C. Albaugh would make the team and went on to also play in the Blue Ridge League for the Cumberland Maroons and Chambersburg Colts. In 1920 he returned to the Virginia League with the Newport News Shipbuilders and the Wilson, North Carolina, Bugs. By the end of February, the Virginia State Corporation Commission had granted a charter to the Lynchburg Baseball and Amusement Company, Inc., and the sale of stock shares was well underway. A total of $3,250 had been raised, leaving $1,750 needed before Lynchburg’s team could qualify for Virginia League membership. With about 100 shares of stock still unsold, a caption on the sports page of the March 2 newspaper read “Loyalty Lacking.” The News went on to say that the “stock subscription…is yet uncompleted” and “the season is near at hand.” An all-out effort was announced to reach the goal of 500 shares. It would take three more weeks to meet that objective. About the same time, on March 20, the shareholders met and officially elected the same officers and board members announced on February 2, with one exception: H. H. Harris resigned as vice president due to business pressures and was replaced by G. Evans Caskie Jr.